Photographer Bruce Polin will be at the Farmer Family Gallery at the Ohio State University at Lima to open his show Deep Park from 4:30-6:30 p.m., Thursday, Jan. 17, 2019, in Reed Hall. The opening is free and open to the public. 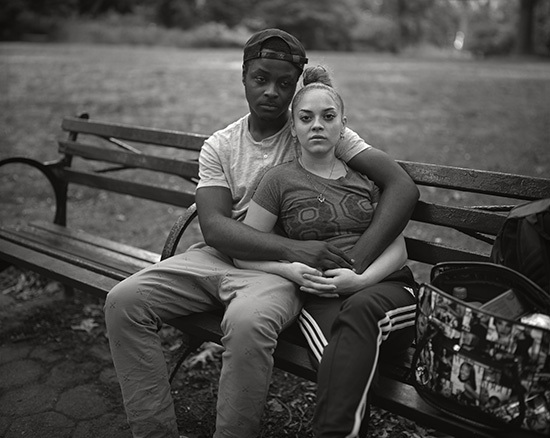 Deep Park is an ongoing series of chance portraits taken by Polin in Prospect Park in Brooklyn, New York, usually using his large-format 8x10 film camera. Throughout the series, Polin examines how we construct very private spaces within larger public spaces. “With these big cameras, a lot of patience is required on the part of both the photographer and the subjects. At some point, my subjects become invested in the process and it now becomes more of a collaboration. They see that I’m building something, and I need their help. The process can effectively isolate us, as if an invisible room takes form,” Polin said. “I look for people who might already be in that private space, so I approach with care, trying hard not to break what they have built. Between 25-30 of Polin’s portraits from the Deep Park series will be on display at the Farmer Family Gallery through Feb. 28, 2019. Gallery hours are 11 a.m.-4:30 p.m., Monday-Thursday. The gallery will be closed Jan. 21 in observance of Martin Luther King Day. The show is free and open to the public. Polin was born in New York in 1960 and began photographing at the age of 14 when his love for theatrical make-up led him to the medium. He later studied photography at the School of Visual Arts and later received a BFA at New York University's Tisch School of the Arts. He assisted photographer Neil Slavin, printed for Rosalind Solomon, and, in the 1980s, managed an art gallery in New York’s East Village. He was the first ‘official’ photographer for the American Museum of the Moving Image in Astoria, New York. He currently works primarily with 8x10 negative film. Polin lives in Brooklyn with his wife, daughters, and his cat, Archie. Photos (from top): Stephen & Dominique, 2017, 24"x30" and Bruce Polin with his camera.